LASAR Post Processor, Run Time and Diagnostic Test Solution - DtifEasy Series | Marvin Test Solutions, Inc.
DtifEasy is a full-featured tool set for importing, converting, and executing IEEE-1445 compliant digital test vectors generated by a LASAR simulation. All four IEEE-1445 file types - UUT model group, Stimulus and Response group, Fault Dictionary group, and Probe group are supported by DtifEasy; providing the user with the ability to execute go/no-go, fault dictionary, and guided probe sequences. DtifEasy supports MTS' 3U PXI GX529x series of dynamic digital instrumentation to 200 MHZ as well as the 6U PXI GX5960, 50 MHz digital instrumentation. All of these instrument families are compatible with the digital logic probe. Overall control and execution of the .tap file conversion process, UUT configuration, and execution of go/no-go and probing sequences is provided by the ATEasy test development / execution environment which is included with the DtifEasy product. And depending on your specific programming needs, the user has the option to develop applications using ATEasy exclusively or control and execute go/no-go and probing sequences using other programming languages such as CVI, LabVIEW, C, C++, and VB. The DtifEasy conversion tools in conjunction with MTS digital instrumentation / systems offers a low cost and superior solution for those users needing to migrate existing LASAR based applications (with .tap files) from a legacy platform to a new test platform. Similarly, by re-simulating UUTs using LASAR (purchased separately), DtifEasy offers users a cost-effective method to re-host UUTs on lower cost, PXI-based, digital functional test platforms. DtifEasy can convert and execute all of the IEEE-1445 file types for use with MTS digital instrumentation and guided probe. All imported .tap files, information for guided probing (including optional images of the UUT), the digital subsystem configuration, and UUT adapter pin mapping are defined in an XML file format – providing a unified and easy way to store and manage all test information for the application. The guided probe consists of a digital probe, a momentary push button and a status indicator. The probe is compatible with the GX529x and GX5960 digital instruments and provides the probed UUT states for the guided probe sequence. The guided probe algorithm will detect “stuck at’s”, supports re-probing of nodes, and allows the skipping of component / node probes - speeding up the overall diagnosis of a UUT. Optionally, the user can incorporate images of the UUT, providing a graphical probe position tool to aid the user when probing the UUT. Other features include the logging of tests, probes, and fault dictionary results in text or HTML format. Support for event programming is also provided, allowing for the initialization or control of the UUT before or after probe events or sequences. 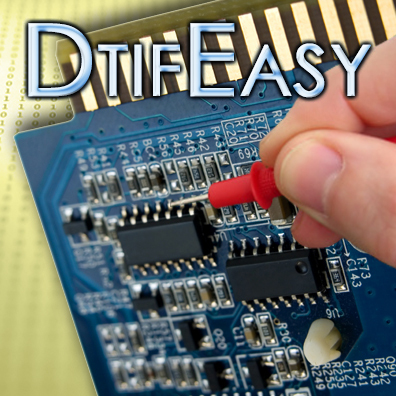 The DtifEasy conversion tool can also combine UUT input & output pins - conserving tester I/O resources and resulting in smaller channel count systems. This is particularly useful when converting legacy test programs which may have relied upon dedicated input and output digital test channels. TS-730 Preconfigured, mixed-signal test platform. Includes up to 96 dynamic digital channels, user power, and analog stimulus / measurement resources. TS-750 Preconfigured, digital test platform. Includes up to 128 dynamic digital channels, user power, DMM and static digital resources. TS-775 Preconfigured, military avionics test platform. Includes up to 96 dynamic digital channels, user power, DMM, 1553 interface, and static digital resources. GX529x Series GX5292: 3U PXI, 100 MHz, 32 channel dynamic digital instrument. Per channel and per vector drive/ sense control. GX5293: 3U PXI, 200 MHz, 16 channel dynamic digital instrument. Per channel and per vector drive/ sense control. LASAR is a tradename of Teradyne, Inc.
4-days DtifEasy training (includes ATEasy) at Marvin Test Solutions (Irvine, CA) for 1-3 persons. Call for larger groups. On-site, 4-days DtifEasy training (includes ATEasy) seminar for 1-3 persons. Call for larger groups.